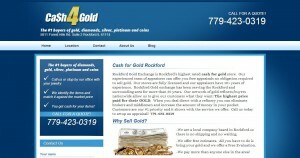 Cash For Gold Rockford address, phone, website, and more. For the past 20 years our #1 mission has been providing the excellent customer service required to keep our clients satisfied 100%. By providing excellent service we can ensure that our sterling reputation remains and we can continue to hold onto our reputable business standards. All our scales are certified and our staff is licensed. Getting cash for gold at Rockford Gold Exchange is an easy process and we guarantee the most accurate appraisal of your gold. We offer the highest cash offers on unwanted gold jewelry in town. Let our professional, licensed & trained staff take a look at your gold today!